A recent thought I’ve been pondering is the default closed approach to education. It’s interesting to reflect how the physical structure of the classroom with walls and doors gets replicated online with firewalls and logins. I can appreciate that in part this is needed to create a closed environment where the student feels safe and secure, but it is also has other factors like license to share copyrighted work or terms of license for learning platforms. It’s ironic that the ‘MOOC as a Service’ (MaaS/xMaaS) offering for Coursera, et al., whilst are open to register still default to a closed mode*, studying in their place under their terms. Even FutureLearn which is designed on social learning principles seems to only consider social in the system. 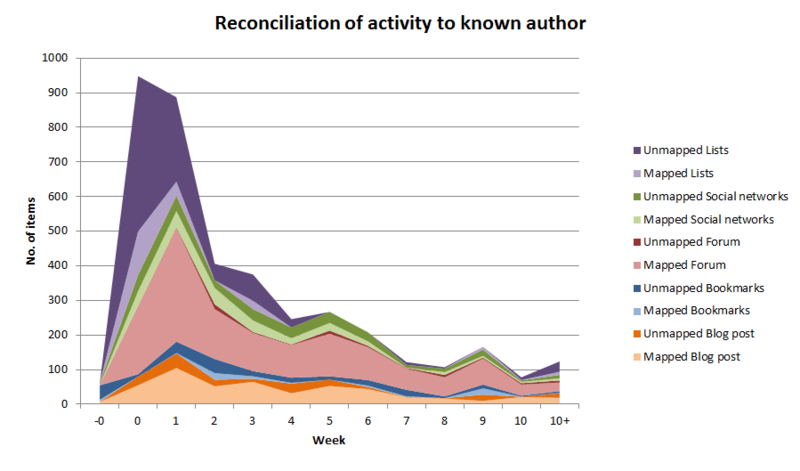 *credit goes to University of Edinburgh’s EDCMOOC for breaking this norm. At the time the work Jim Groom and Co. using the combination of WordPress/FeedWordPress looked blew me away. Here was a solution that anyone with a bit of WordPress self-hosting could use to create a course activity hub. Scaling this solution to an institutional level is probably not practical (I’m sure some would disagree) but having supported educational technology for a number of years I appreciate some of, if not, the best teaching and learning comes from the individual/small team rather than a campus wide solution so it seemed an ideal path to follow for ocTEL. A feature of FeedWordPress I hadn’t completely appreciated until the course was running was that as well as a tool for data aggregation the plugin attempts to match authors to existing user accounts “with the same name as either (1) their login, (2) their display name, (3) their e-mail address (if given), or (4) one of the “aliases” listed in the user’s profile” [Ref], effectively providing a mechanism to partially de-cloak community contributions for different channels. But how effective is it actually? 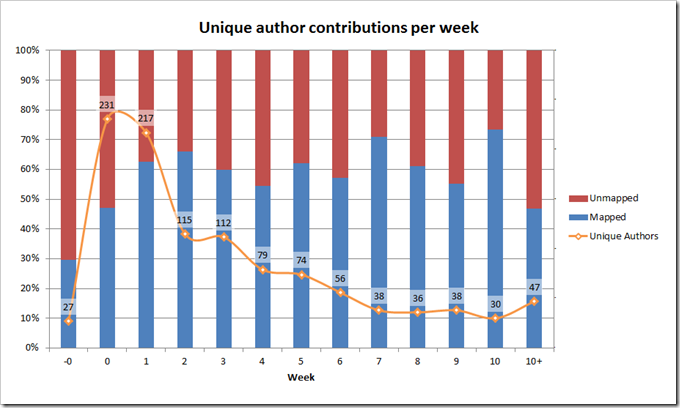 How effective is FeedWordPress in resolving author identity? The answer … around 50%. 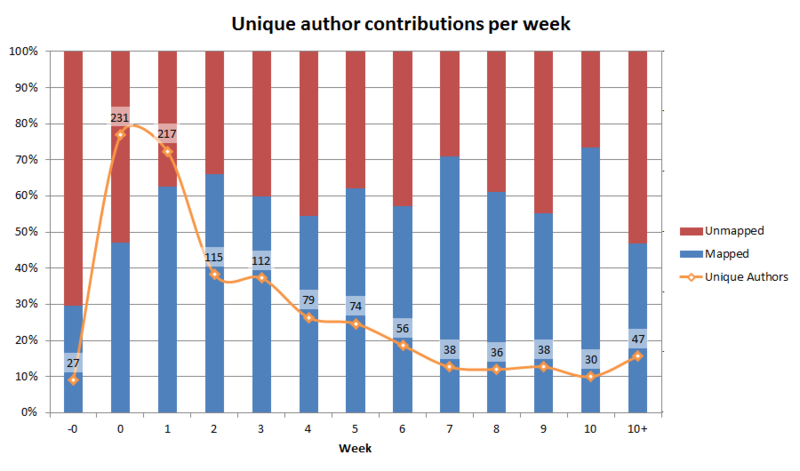 The graph below shows a summary of the unique author contributions for each week of ocTEL and the proportion of which are mapped to a known existing registered participant of the course. The next question is given ocTEL aggregated multiple channels listed where did FeedWordPress struggle to identify the activity author. The graph below shows the volume of items collected by ocTEL in each channel. Graphing this proportionally we can see the channels where reconciliation of authorship was not achieved. 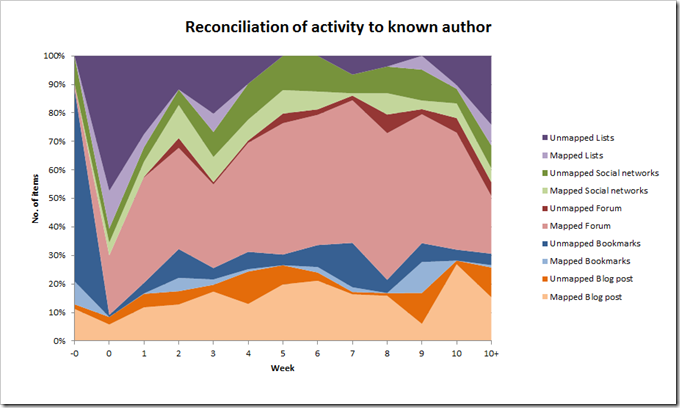 Given forum posts and blog posts are registered to a user account why are they unmapped? Why are the proportion of unmapped lists (LISTSERV) posts so high? Why is FeedWordPress not mapping a proportion of the other activity feeds? Forum posts are made through the bbPress plugin which is integrated into the ocTEL site. This means that only registered users can post messages. Consequently forum posts should be associated with a known user. Examining the data shows there are 3 unmapped forum accounts, one of which contributing 51 of the 1,406 forum posts. It is unclear how these accounts became unmapped. Similarly blog posts are collected by registered users submitting their blog feed, so in theory there should be a direct association. 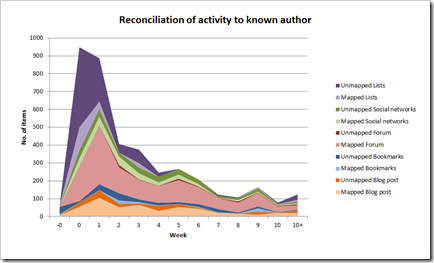 Of the 72 users who registered a blog feed and published a post for the ocTEL course 20 were unmapped. This problem has been traced to a bug in the custom code that drops rss link information for the authors feed. FeedWordPress handles this missing data by trying to remap authorship to the table of users. If unsuccessful in resolving to an existing author it creates an unmapped account. Because of the way author information is presented from the JiscMail Listserv list which mixes first name/lastname or includes name and comment [source feed here], authorship is unmapped. Reconciliation is also impacted by the limitations in the way FeedWordPress looks up user fields discussed in the next section. Deeper inspection of the FeedWordPress code also reveals a bug which means user aliases are only used if contained in the user description meta field. This means alternative names enter by the user such as Twitter account screen names which are stored in separate user meta fields are not used when reconciling authorship. Whilst the levels of authorship mapping for 3rd party channels and within the ocTEL site are below optimum areas for improving this technique have already been identified and are relatively easy to resolve. Once these have been implemented further experimentation is required to test the ability for FeedWordPress to effectively resolve activity within a connectivist context.